Destination marketing organizations (DMOs) often need to measure what they can’t manage. A marketer’s typical job is to create demand for a product, but countless external factors affect visitation, making the effectiveness of destination marketing difficult to measure and communicate succinctly. At Simpleview Summit 2016, Destination Think!’s Chief Strategist & Partner William Bakker tackled this problem in a presentation called “Measuring Success in the New World.” His talk shares four measurements DMOs can use to create simple benchmarks to track their destination’s improvement over time. These methods can also help DMOs demonstrate the value they create for stakeholders. Watch the full presentation below or read the summary notes below to learn about the four metrics. By using the right tools, these four aspects of a DMO’s performance are easy to measure and easy to track over time. A destination’s brand consists of the stories that you hear from other people or the experience that you have on the ground. Since word-of-mouth marketing is the number one driver for tourism, destinations must deliver remarkable experiences that will cause visitors to share stories that create demand for visitation. How can a destination measure the quality of the experience and therefore the quality of the word of mouth that follows? Net Promoter Score (NPS) rolls it all up into a simple question: On a scale of 0-10, what’s the likelihood that you would recommend this destination to a relative or co-worker? The survey results use a simple formula that will give you a number to use as a benchmark. Over time, you can look at the data from different angles to filter for demographic, times of year and other factors. Studies have correlated business growth to NPS growth and deeper analysis is available in the book The Ultimate Question 2.0. Net Promoter Score is an essential tool because only a DMO can lead this on a destination-wide level. It also sets the right priority – creating great experiences for visitors and guests. Today’s digital and social media platforms give us endless amounts of data to measure: likes, comments, shares, follows, clicks, views – the list never ends. The value of social media is generated through engagement, but what do all the numbers mean? If the overwhelming barrage of data is valuable, how can DMOs extract the numbers they need to measure success in their reports? Meanwhile, industry stakeholders are looking for results. At a typical DMO board meeting, the inevitable question always comes up: “What’s the ROI of social media?” Digital engagement is still not seen as inherently valuable as traditional marketing campaigns are, and many people suffer from “award-winners’ syndrome.” Agencies and DMOs both love to show off shiny awards that tend to reward the large, flashy ad campaign with the expensive and impressive TV commercial. In this way, awards are sometimes used as a proxy for success. This “beauty-based marketing” is not necessarily about being effective, but about having an impressive-looking campaign. 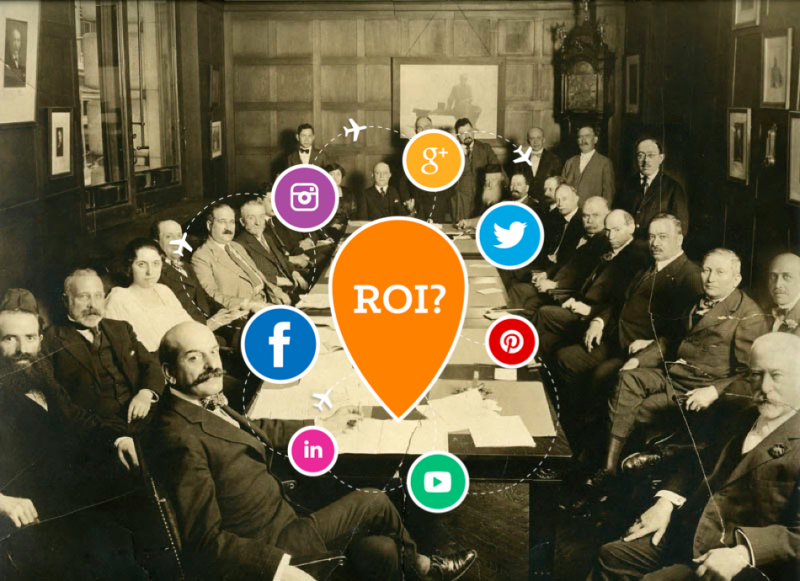 To better understand the return on investment (ROI) question, six DMOs recently collaborated to come up with a way to measure the effectiveness of social media engagement. The goal of the project was to provide a way for a DMO of any size to generate a conservative estimate of the potential economic impact of their efforts. A destination marketer’s role is to generate demand and create a desire to visit, so the focus here is on what the DMO has achieved in the mind of the consumer. This stands apart from the conversion stage where that person would make a purchase. With the POI formula, a destination can suddenly make sense of the endless engagement metrics, making it easy to benchmark and measure potential impact over time. The POI formula is an open source project that has picked up interest from many DMOs internationally. It’s still in its early stages and will grow and improve with support from the global community. Next steps for the formula may include adding support for additional engagement channels like websites, email marketing and content marketing; expanding to cover additional markets; and creating an online tool so that users can compare their results with similar DMOs around the world. Learn more and download the free, open source Potential on Investment (POI) whitepaper and calculator here. Given the changes taking place around storytelling and travellers today, your DMO’s success now rests in the hands of your operators. They’re the ones who will deliver the visitor experience that will elicit all the positive word of mouth, and their messaging is an important voice that tells the story of your destination. Collectively, these stories add up and will impact visitation. To measure operator effectiveness, DMOs can use a digital assessment to benchmark and audit a sample of their industry. This helps a destination identify opportunities for education to improve visitor experiences, promotion and the resulting word of mouth shared by visitors. Over time, a DMO can lead change across the destination by responding to the improvements and challenges observed. How’s your DMO progressing to take advantage of the new marketing environment? As Peter Drucker said, “Culture eats strategy for breakfast,” and your corporate culture must be healthy in order to support change. Digital and social media teams tend to remain on the outside of today’s corporate culture and this can stifle their effectiveness. Destination Think!’s destination assessment is an index to score your DMO across many factors as a benchmark for future improvement. Changing an organization requires a delicate balance, so it must be done gradually until the organization reaches a cultural tipping point. The shift to the new marketing world happens over time, sometimes one department at a time. As Jesse Desjardins, Global Manager, Social & Content for Tourism Australia says: “You need to lead your organization through the unknown.” As you lead your organization, you must lead your industry partners as well, by osmosis. These four ways to measure success can help your DMO more effectively measure success, educate stakeholders and move your industry forward to adapt to the changes in today’s marketing world. Related reading: Are you invested in the right business models? Chief Strategist & Partner at Destination Think! William is a father, husband, geek and veteran Destination Marketer. Before joining Think! he worked at Tourism British Columbia for 11 years. William was born and raised in the Netherlands and lives in Canada. As our Chief Strategist and keynote speaker, he moves between our offices a lot. His family loves to travel, and they often come along for the ride. His daughter even has her own travel blog. If you have heard William speak, you know he is a big Formula 1 fan. Some wonder if the reason he joined Think! is to turn every F1 host destination into a client. You can read William’s thoughts on his blog wilhelmus.ca. Awesome preso – am wondering if you’ve updated any of the channel % for POI. Am thinking Insta now has considerably bigger impact than it did in 2016?